My modus operandi when it comes to the internal organization of my purse is more or less; "fling it in there and fuh'geddaboutit." This carelessness makes me feel pretty good for awhile, as most lazy things do. That is; until someone asks me for a pen. Suddenly my inability to uphold any sort of internal organization system is made apparent. We will find the pen. But only after both myself and my partner have been made privy to the disgraceful assemblage of personal belongings I have been mindlessly toting around all week. It is an intimate moment both weirdly illuminating and subtly shaming. After nine months of near exclusive use, I am pleased to report that not once has this sort of unfortunate public embarrassment occurred since devoting myself entirely to the Winter Session Day Bag. I believe this relationship to have staying power. I may have found my ONE bag. Or at least my one bag for awhile. I suppose at the absolute very least, I can say with full confidence that this latest relationship has really allowed me to define and claim the types of bags I generally gel with. And really -- even this in itself is no small feat given the sheer amount of shapes and sizes and personality types of bags that are out there. Nothing is truly certain in this life, but one thing is clear: If there is to be a bag after this one -- and golly gee I hope not -- its acolyte will have some very tough measuring up to do. Also, there will be an exact pocket-to-surface-area quota that this bag's successor will most certainly need to meet. And trust me -- I can and will be strident on this. The WS Day Bag, like any good partner, can inhabit the world of both potted office plants and en plein aire patio parties with equal verve and aplomb. 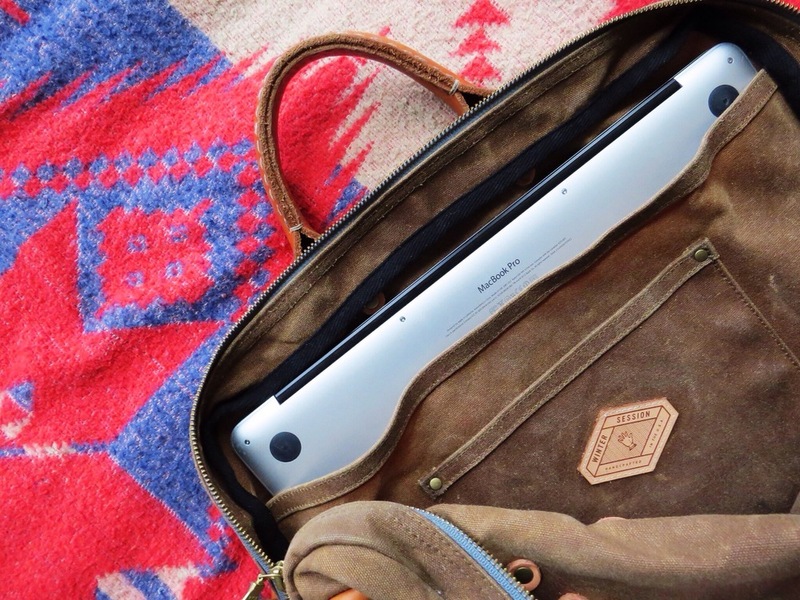 For work, a laptop and all its related ephemera live neatly within a clever side pocket. During weekends I can say from experience that a change of clothes, a makeup bag filled with all sorts of girly things, an 'I woke up like this' t-shirt and a bottle of Malbec can be toted from office space to his place with ease. Also like any good partner, the WS Day Bag bag keeps me in line. I'm simply on better behavior. Gone are the days of tossing a half-eaten Cliff bar into a pocket. No longer will I cart around stale crusts of crumpled receipts or allow my spare change and bobby pins and tampons to clink around at the bottom. It just wouldn't be right. One of the gals I know recently became engaged. After congratulating her I asked; "So -- what's the biggest difference about being an almost married person?" I have never been engaged, so I am almost always curious to to hear wether or not this major thing has a way of crystallizing one's inner understanding and sense of self. My friend looked to the side for a minute to think. Her well-considered answer made me laugh and also nod in agreement, for it mirrored the way I have felt since entering my very exclusive relationship with this bag. "The biggest difference is that now I feel as though I can no longer be a slob. Like, ever. And by that I mean like, I can't show up at work with bad hair and a crap outfit, and after work I can't eat cereal out of the box in the dark while watching reruns of Law and Order SVU. It just wouldn't be doing right by him, you know?" It was nearly two years ago to this day when I was first introduced to the work of Winter Session by way of Roy Katz and Tanya Fleisher, the young married couple who began the business back in 2010. Ever-so-appropriately the accidental introduction to their brand occurred during a weekend away with my then boyfriend. I remember two things about that trip to Chicago distinctly. First: That I had in my possession one terribly outré nylon duffel because at the time I owned nothing better. Second: that because of this subtle fashion faux-pas, my spidey senses for premium waxed cotton canvas accessories were most certainly tingling. All weekend the same veg-tanned totes had a habit of turning up all over town. I loved them for their unisex sturdiness, their cloudy color palette, and the elegant simplicity of their leather-embossed logo. I saw the bag worn by a U of Chicago professor waiting in line for his pour-over coffee, and later tucked beneath the arm of some young mom at the market with a healthy stalk of kale poking out the top. At Heritage, the handsome denim aprons worn by their waitstaff were the handiwork of the same brand name moniker, and finally, at our last stop before lunch -- Independence, I saw the bags propped alongside back issues of Inventory Magazine and S.N.S. Herning sweaters. It was all too strange and Chicago was simply too large a city for these sightings to not hold some hidden significance. Or at least, this is what told myself when I had the audacity to shoot Roy Katz and Tanya Fleisher an email asking if I could visit their studio. Almost more audacious than my out-there email is that both Tanya and Roy responded right away and then obliged. They said yes; but that I had better make it quick if I wanted to peep their space. The Winter Session Workshop would be moving to Denver, Colorado, permanently -- in less than a week's time. I was welcomed into the pair's plant-covered street-facing workshop, and the two chatted with me for much longer than was socially necessary -- something I am eternally indebted for. They walked me through their vision and process. An idea that was informed by intelligent design yet handcrafted from a place of raw and palpable passion. At the end of our visit, I was told to keep in touch. I left feeling buoyed by their kindness and inspired by the pervasiveness of good design. ELIZABETH: WHAT DO YOU LOVE THE MOST ABOUT YOUR NEW HOME IN DENVER? E: WHO ARE FOUR COLORADO-BASED CREATIVES YOU ARE ESPECIALLY GLAD TO KNOW? Tiffany Iung a.k.a tifamade -- we’ve had a great time getting to know Tiffany and her roving sandwich-making talent. She is one of those culinary wizards who makes her craft look effortless, serving up mouthwatering combinations of veggies, herbs and cheeses while keeping a casual Euro-cool (picked up in Paris, perhaps, where she first started her business on a pink bicycle). Over the summer, we hosted her -- and her brightly colored coolers and picnic baskets -- on Thursdays for ‘Sandwich Sessions’, which drew an enthusiastic crowd of friends and neighborhood colleagues for what became impromptu lunch parties at our shop, The Outpost. Paul Michel a.k.a. Mountain vs. Plains -- we’ve watched Paul really flourish over the past several months as he took the plunge to pursue his fine art and illustration full-time. From a sold-out show at Svper Ordinary, one of Denver’s dynamic galleries, to his series of cleverly crass greeting cards (a crowd favorite), to his first-ever mural currently gracing a wall of our building here at the Outpost, he’s been making quite the name for himself. And having a work of art on our building, with the blessing and support of our landlord, makes us smile every day. A Small Print Shop -- operating out of an ex-garage in a now bustling pocket of Larimer Street, this small but incredibly dynamic team of designers and screenprinters has played a big role in shaping the visual vocabulary of Denver-based creatives. This part of the country has a strong streetwear/skate brand influence, and so branded T-shirts are a staple wardrobe piece. But those simple articles of clothing, when designed and printed with integrity, quality and thoughtfulness, become an accessible, highly sharable commodity to show support for businesses, bands and events that are important to all of us. We also work with A Small Print Shop to print branding and custom designs onto pieces we’ve made for local businesses, like denim aprons for Denver Bicycle Cafe and Lucky Pie Pizza. Luca Venter -- Luca is an immensely talented photographer who’s been instrumental in helping us to develop and articulate our vision and presence through images over the past year. With Luca, we shot our first lookbook last fall, as well as other product photos and our “Making of a Day Pack” video. He has a keen eye and independent approach to his styling and directing, and it’s neat to literally hand over our products -- our creative vision -- to someone else, have him run with it, and yet feel like the end results are exactly what we want. Luca also travels and works with musicians, so through him we get to vicariously have a bit more badass life! Tran Wills, a.k.a. ‘Superwoman’ -- Tran is a happily married mother of four who co-pilots Svper Ordinary, one of Denver’s hottest art+design+homewares destinations; created Brick and Mortar, a roving locally-stocked general store that rocked the Denver retail and event scene last summer; and recently opened an eco nail salon with her mom. Oh, and did we mention she’s always wearing slammin’ outfits? She is a selfless connectress, and always finds the right balance of experimentation, knowing when to push the envelope and when to pull back. We’ve created some special bag and wallet colorways to fit her black-and-white aesthetic at Svper Ordinary and are also working on some totally new custom pieces to be released soon. E: COMPLETE THE FOLLOWING STATEMENT: "A DAY IN DENVER WITH NO OBLIGATIONS WOULD BE BEST SPENT DOING THE FOLLOWING: "
E: WHAT DO YOU FIND TO BE ESPECIALLY FANTASTIC ABOUT BEING YOUR OWN BOSS? WS: Running a six person business allows us to try out and make improvements pretty easily. For example, we’ve just switched over to a four-day workweek, which allows everyone a more flexible weekend schedule, and gives us (Roy and Tanya) more time for big picture planning -- and painting our new house! Making that change was as easy as bringing it up during an impromptu meeting about apron design. In a broader sense, this constant evolution, comprised of small shifts via frequent conversation -- being married really helps facilitate that part -- helps us to think critically about the tone that we want to set at Winter Session, and what exactly it is that we offer to the world. We feel very strongly that what we’re “selling” isn’t just a set of well-coordinated waxed canvas pieces featuring nice brass zippers (although, don’t get us wrong, it is incredibly satisfying to have our personal creativity and business efforts embraced and validated by discerning consumers, and we recognize and are humbled by that privilege).